Sometimes it’s nice to take a looser approach to entertaining during the holidays and let friends and family swing by all day, instead of throwing a sit-down dinner party. You could do a ham or a turkey ― but why not serve something less expected (and quicker to make)? The fragrant spice rub used to make this dish is good on chicken and spareribs as well. Make extra and store in an airtight container for up to a few weeks–it’s like money in the bank. Prep and Cook Time: about 40 minutes, plus at least 1 hour marinating time. Peggy Knickerbocker suggests succulent, aromatic spice- and seed-encrusted pork tenderloins, accompanied by an hors d’oeuvre of tender little bay shrimp on endive leaves (replenished now and then from a tray in the fridge), flavorful roasted vegetables, an escarole salad that stays crunchy for hours ― and a luscious, earthy Barham Mendelsohn Pinot Noir from Au Bon Climat. On a side table, she sets out a couple of surprising desserts: sliced oranges sprinkled with pomegranate seeds and fizzed up with sparkling wine, and a moist, almost black gingerbread made with Guinness stout. Sometimes it’s nice to take a looser approach to entertaining during the holidays and let friends and family swing by all day, instead of throwing a sit-down dinner party. Cookbook author Peggy Knickerbocker suggests succulent, aromatic spice- and seed-encrusted pork tenderloins, accompanied by an hors d’oeuvre of tender little bay shrimp on endive leaves, flavorful roasted vegetables, and an escarole salad that stays crunchy for hours. 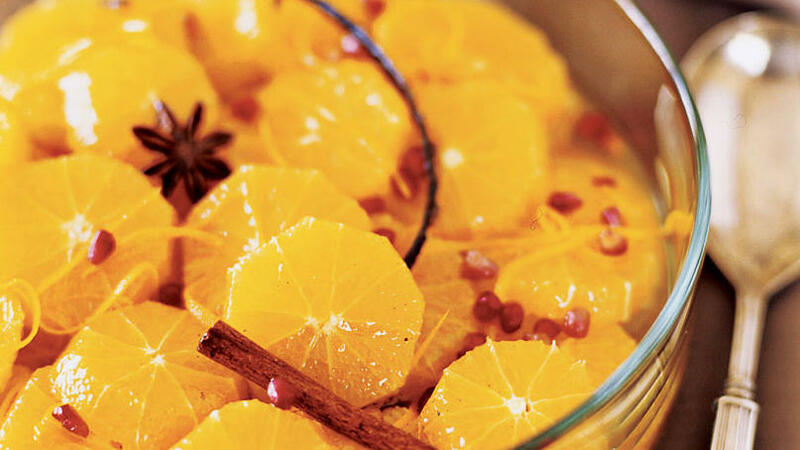 On a side table, she sets out a couple of surprising desserts: sliced oranges sprinkled with pomegranate seeds and fizzed up with sparkling wine, and a moist, almost black gingerbread made with Guinness stout. Click ahead to get her recipes. Peggy based this menu’s recipes on ones in her fun and graceful book Simple Soirées (Stewart, Tabori & Chang, 2005; $35). All of them may be made several hours ahead if not the day before, and all taste fine at room temperature ― which means that you don’t have to scurry around at the last minute reheating anything. You can just put out the food, sit back, and enjoy your company.